Considering my addiction to Iced Latte’s is a thing of the past, slathering on Andalou Naturals “Kukui Cocoa Body Butter” is about the closest I get to coffee these days. I ache for the sweet smell of a roast coffee bean every so often, and I swear this stuff smells like the best Caramel Latte EVER. Organic, Fair Trade and made without GMO’s, gluten, parabens, petrochemicals, phthalates, sulfates, synthetic colors, dyes and fragrances, I couldn’t ask for a better body butter, and I’m looooving the fact that it’s made with organic Evening Primrose Oil, Acai Berry, Goji Berry, Kukui, Vitamin C, Capuacu and of course, coffee, to name a few. 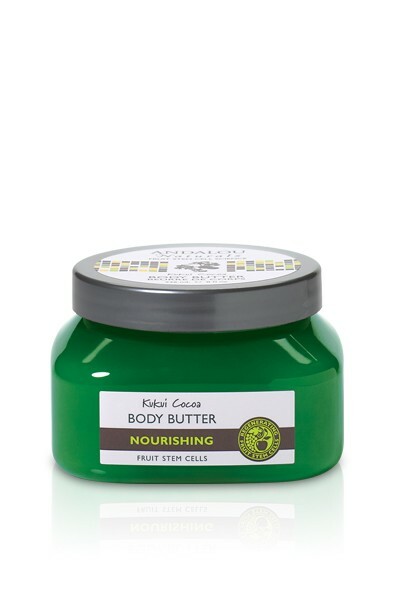 Bottom line: Kukui Body Butter is thick, rich and creamy. It takes a little effort to get it all worked in, but it’s so worth it the next day to see and feel your skin…. literally glowing, hydrated and ultra moisturized. According to Andalou, who are right here in Novato, CA. … Apple + Grape Fruit Stem Cell Cultures advance the longevity of skin stem cells and help protect skin’s DNA against environmental stress and aging factors, and it’s also Verified Gluten-Free, 100% Eco-friendly, Vegetarian & Cruelty-Free! Mmmm… will have to pick this up next time I stop in our new Whole Foods here in Charlotte!